Some of the best advice out there came straight out of the mouths of our favorite Disney characters. Living by the words of Mary Poppins alone would keep life organized and manageable. How can you not be happy when you hear pretty much anything Winnie the Pooh has uttered? And my two favorite words: Hakuna Matata. 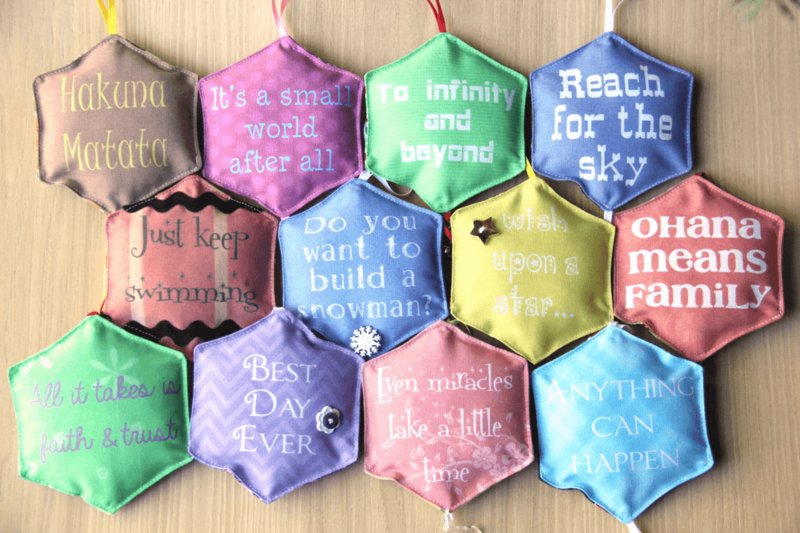 Why not hang some Disney words of wisdom on your holiday tree? 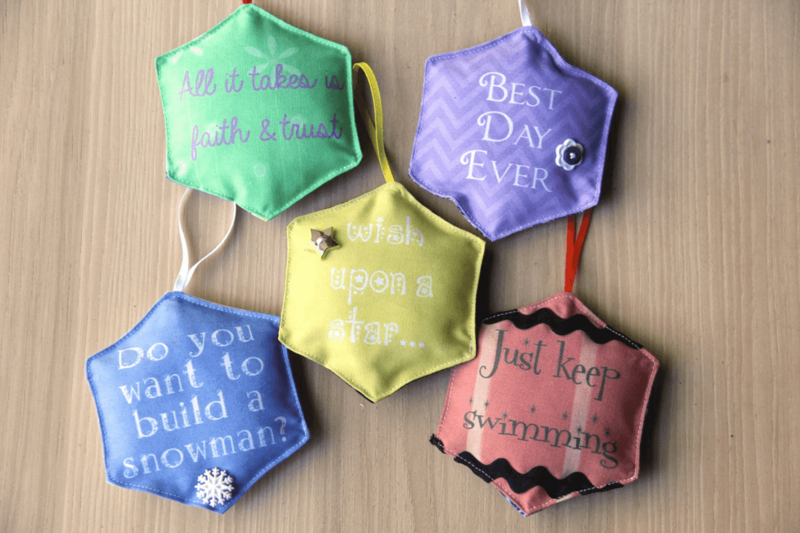 These DIY Disney ornaments are easy enough for even a novice sewist, and can be made with a machine or by hand. 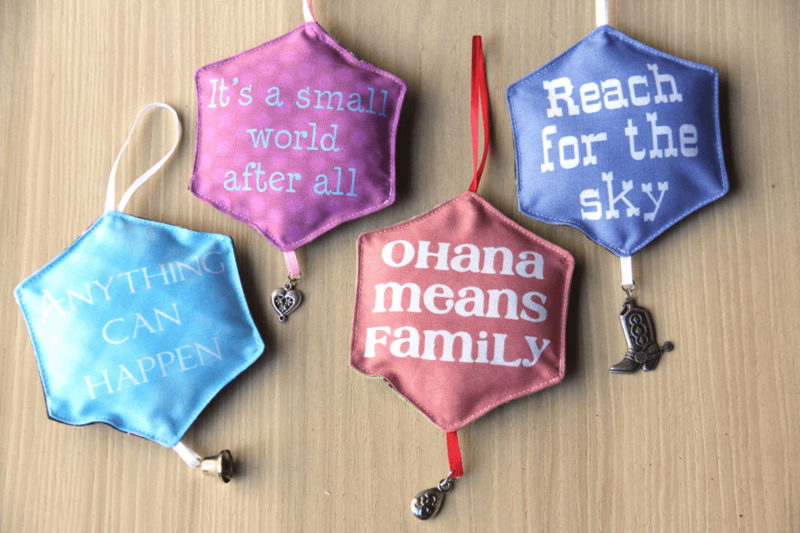 To make these DIY Disney ornaments you'll need the printable PDF, plain white cotton fabric for the front, a cotton print for the back, stuffing (also known as fiberfill), 1/4" wide ribbon and any buttons or other embellishments you'd like to add. 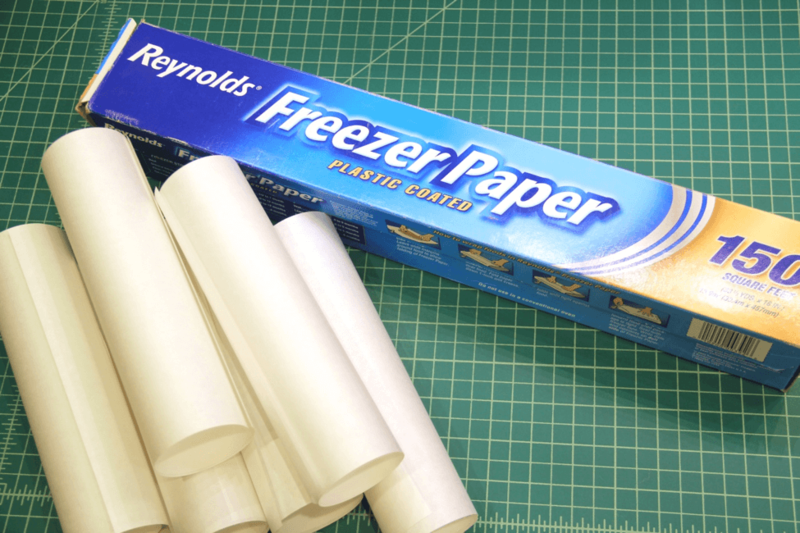 You'll also need a roll of freezer paper, which can be found in most grocery stores. 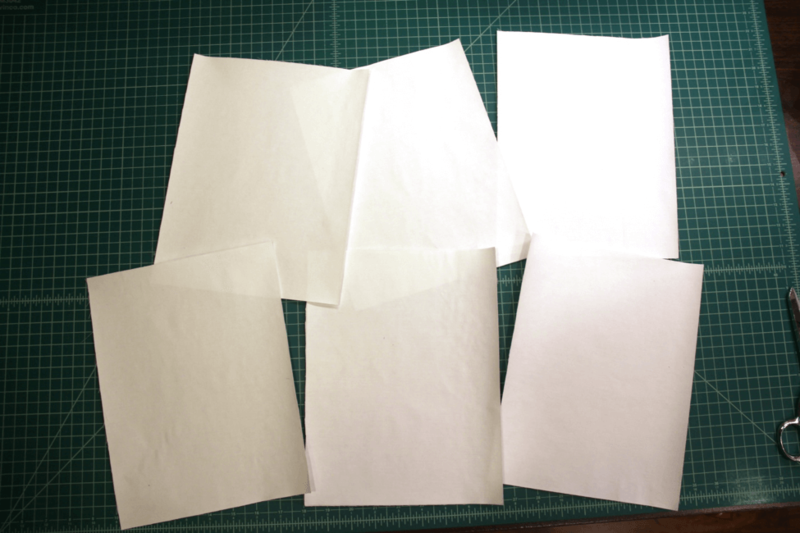 Cut the freezer paper into 8 1/2 by 11" sheets. 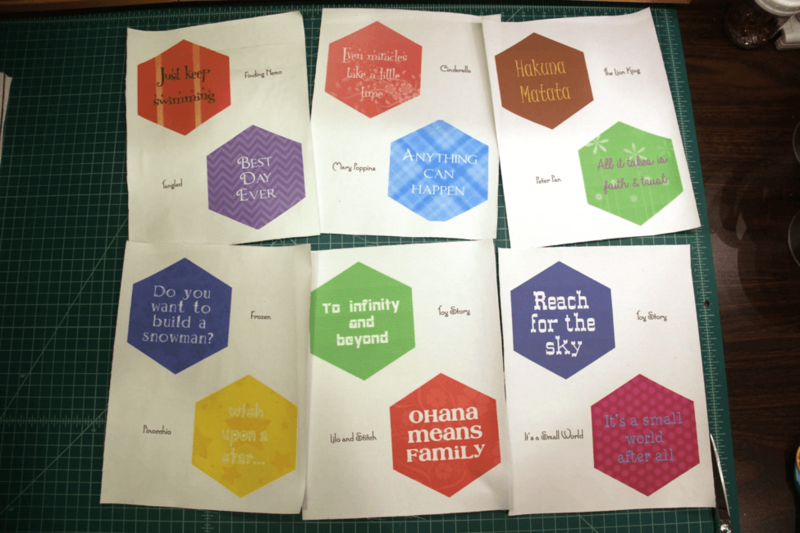 If you're making all of the DIY Disney ornaments, you'll need six. 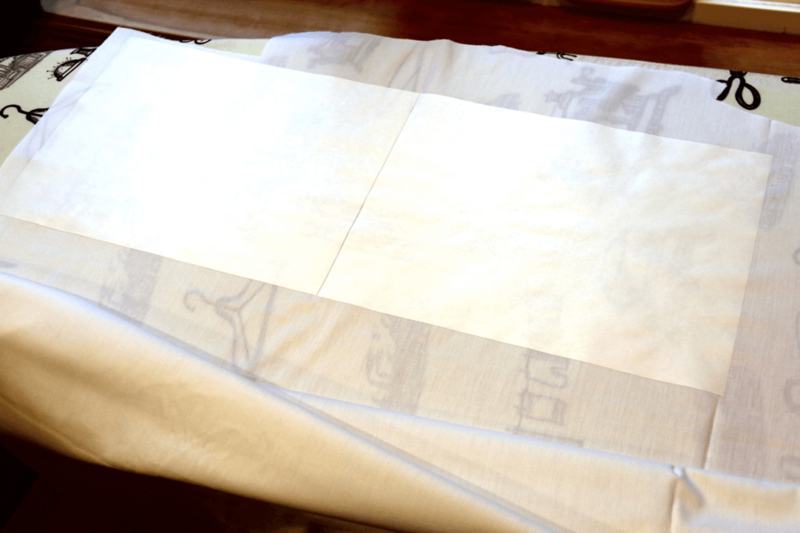 Lay the white fabric with the wrong side up on an ironing board. 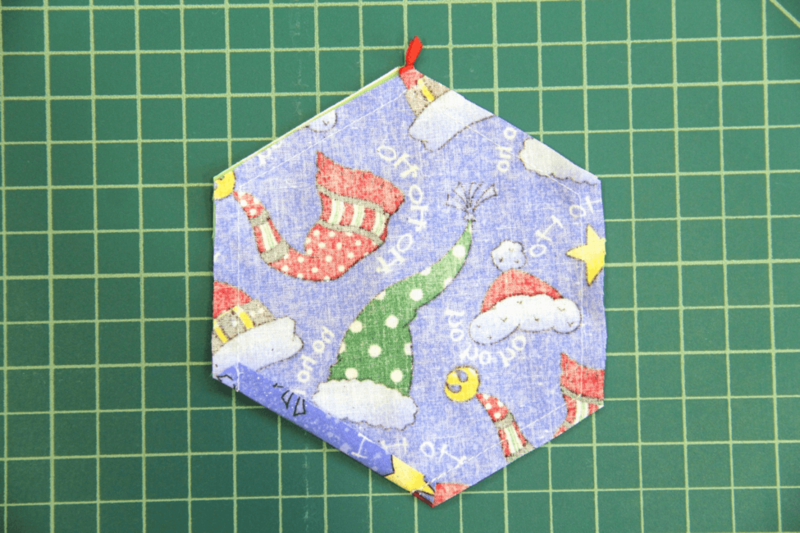 Place the freezer paper on the fabric with the shiny side of the paper down. Iron the paper onto the fabric using a cotton setting and no steam. 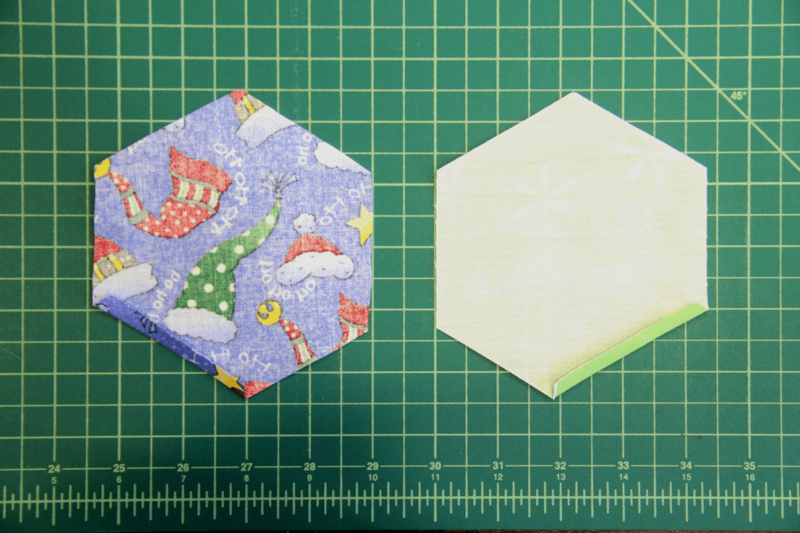 Cut the fabric around each freezer paper sheet. When you're finished, you should have 8 1/2 by 11" sheets of fabric with paper attached to the back. 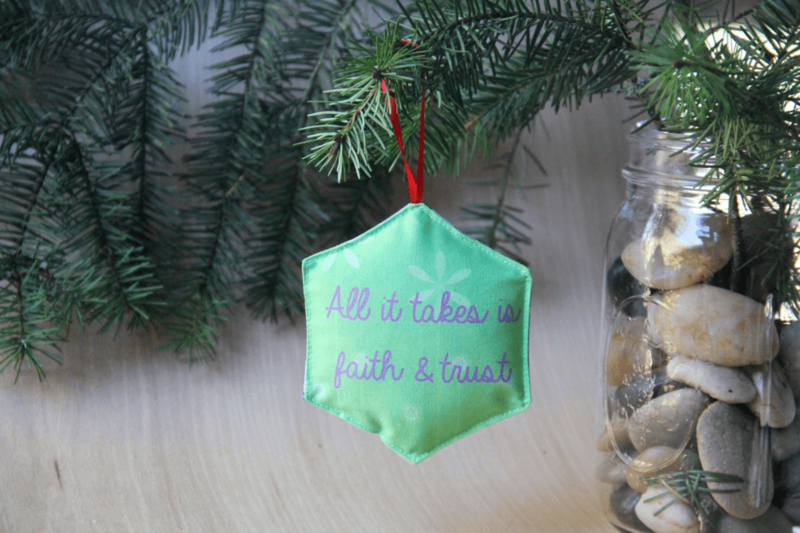 Print the DIY ornaments on the fabric as you would paper. If your printer has a bypass feed where you can load the fabric into the back that generally works better, but I've also printed these from the tray. Make sure there are no stray threads on the edges that can get caught inside your printer. Let the ink dry for a few minutes before proceeding. Carefully peel the paper off the back of the fabric. Cut out each ornament around the edge. 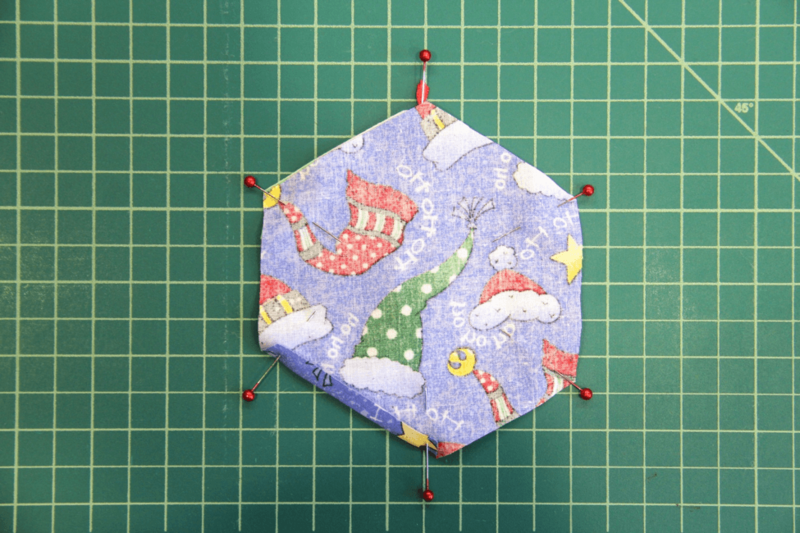 Using an ornament as your pattern, cut a matching piece for the back of each from the printed cotton fabric. Cut an 8" length of ribbon and knot the ends together. 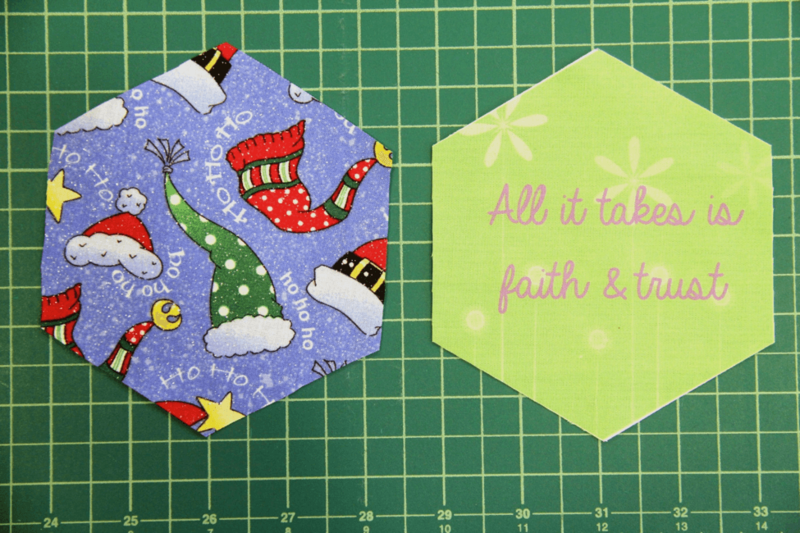 With the wrong sides facing you, press the straight section of the ornament on the bottom right up 1/4". Do the same with the back, only the bottom left. Turn the DIY Disney ornament face up. Place the knot of the ribbon at the tip of the top point, with the ribbon loop laying inside the ornament. Pin in place. Lay the back piece face down over the top. Pin in place. Note that the two edges you turned up and pressed should match up here. 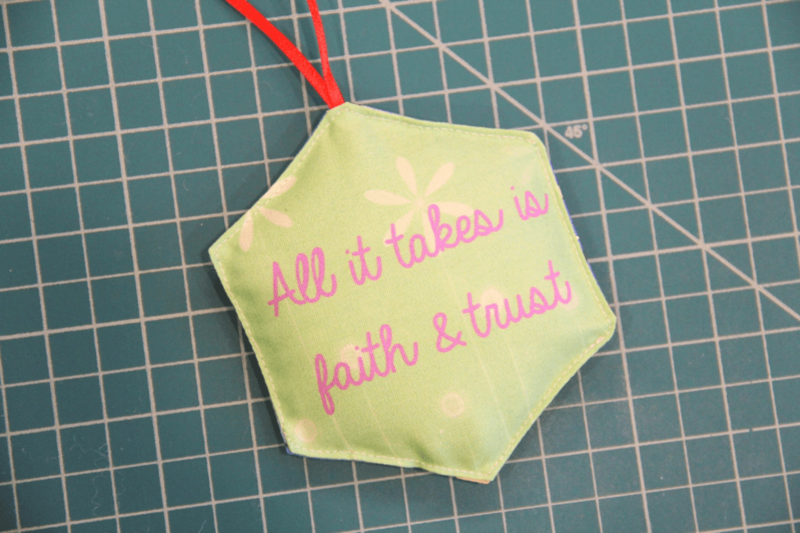 Stitch 1/4" from the outside edge, either with a sewing machine or small hand stitch, leaving the folded edge open. Turn the ornament right side out through the opening. Press with an iron. Stuff the ornament with the fiberfill, tearing off small pieces. By adding one small piece at a time, rather than stuffing a big piece in all at once, it will keep your project from becoming lumpy. 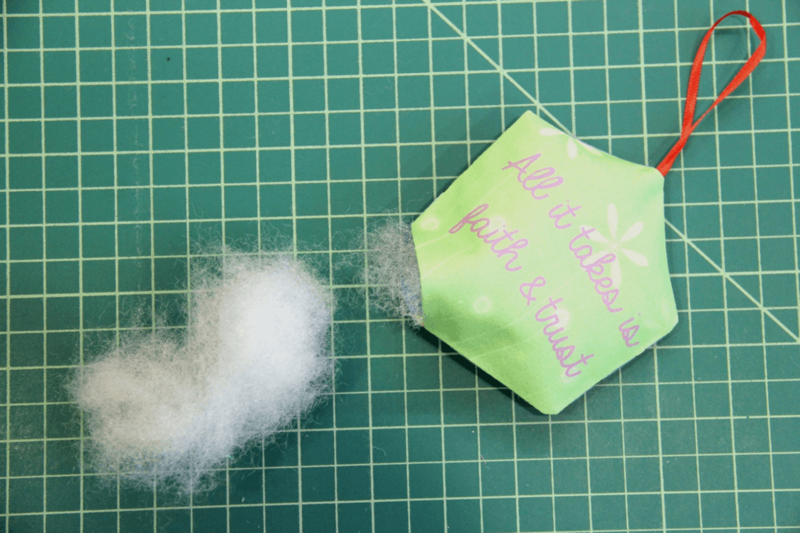 You only want light, loose stuffing, just enough to give your ornament a little dimension. You can sew the opening closed by stitching all the way around near the edge with a machine or stitching it closed by hand. If you want to stretch your sewing skills a bit, you can add some buttons or trim. 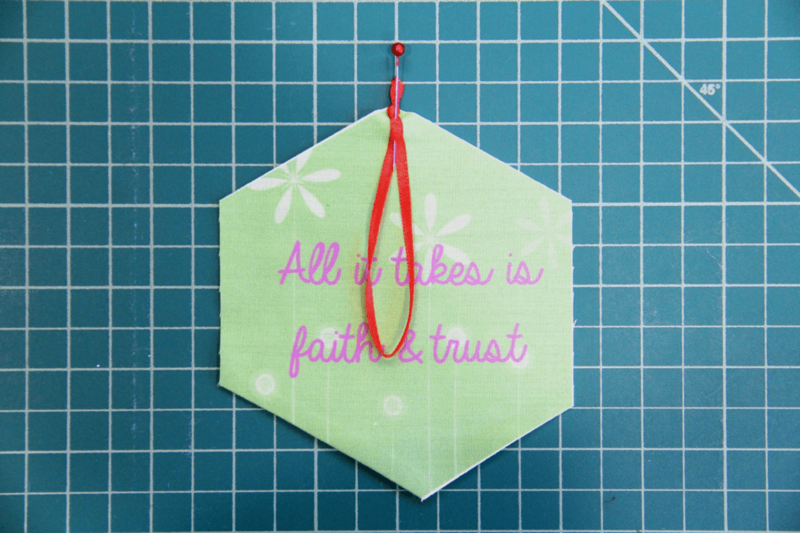 You could also add a smaller ribbon loop to the bottom the same way you did at the top to add a hanging charm.